Catahecassa, also know by his Anglo-American name, "Black Hoof", was a Shawnee chief. Little is known about his early years. Some historians believe he was born in 1717, but this seems unlikely considering that he lived until 1831. His birth probably occurred in the northwestern part of modern-day Ohio. Allied with the French, Black Hoof was present at the defeat of Edward Braddock during the French and Indian War. Although it is not confirmed, many historians believe that he took part in St. Clair 's Defeat and Harmar's Defeat during the 1790s. He did fight at the Battle of Fallen Timbers and represented the Shawnee at the signing of the Treaty of Greenville. Following the Treaty of Greenville, Catahecassa became convinced that American Indians had no hope against Anglo-American incursions except to adopt their customs. Using his influence with the Shawnee, Catahecassa encouraged the Shawnee to adopt the whites' way of living. By 1808, his followers established farms at Wapakoneta. A member of the Society of Friends visiting Wapakoneta reported that Shawnee were farming over two hundred acres of land. There were several head of cattle and hogs, and other improvements included the construction of a sawmill and a grist mill. Catahecassa supported peace with the Americans and encouraged the Shawnee to do the same. However, conflicts between the Shawnee and the Americans continued. 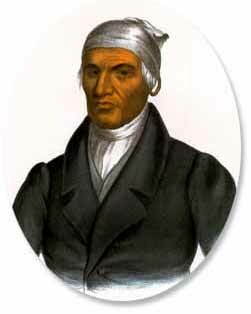 Catahecassa proved to be a major problem for Tecumseh and the Prophet as they tried to unite the American Indians of the Ohio Country against the white settlers during the early 1800s. In 1826, Catahecassa organized the Shawnee at an emigration camp set up at Wapakoneta. Several hundred Shawnee left for the Kansas territory. The migration took nearly eighteen months and was a difficult journey. After leading his followers to Kansas, Black Hoof returned to Wapakoneta. He died there in 1831.